This blog is NOT BY Allen West. I am a small-town heartland American who APPRECIATES Allen West. 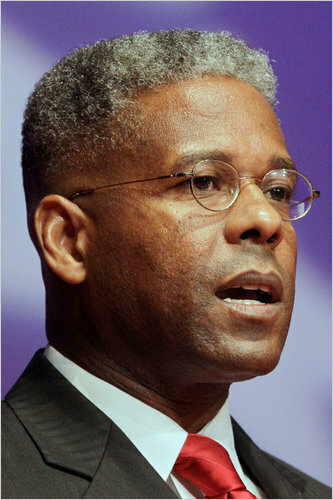 My purpose is to explore the issues in which Allen West's leadership could make a difference for our country. If you think Al Franken won his Senate seat fair and square, don’t waste your time on this page. If you want to prevent elections from being stolen, you’re in the right place. Is it too much to ask that U.S. elections should be at least as honest as those in Mexico, where voters are required to show a photo I.D.? Or that our elections should be at least as fair as those in Iraq, where the famous “purple thumbs” keep people from voting twice? Consider: Every vote cast by a felon, illegal alien, “Mickey Mouse,” dead person, etc., cancels out YOUR vote–and thus disfranchises you. Multiply this by a few million on the national level, or even a few hundred on the local level, and you can steal an election. ACORN, the SEIU and other leftists know this well! People who shouldn’t be voting (or who don’t even exist) cast votes–while, on the other hand, people who risk their lives defending our liberties are effectively denied the right to vote! The disfranchisement of military voters overseas was revealed at least as far back as the election of 2000–and yet, by 2010, not only had the problem not been solved, but it was worse. Are we going to let another ten years go by without correcting this injustice? The sad thing is that John Fund wrote that book in 2008. We had two whole years to clean things up–and didn’t. We have no excuse now! Let’s make sure we guarantee honest, fair elections before November 2012! Here’s a bunch of ordinary folks who were inspired to make a difference in Houston, TX, in 2010: the King Street Patriots. They started a project called True the Vote, which they urge others around the country to emulate. This page will be updated as more election reform groups and efforts get started around the country. We hope to see many local chapters of True the Vote. Please use the comment section below to share ideas and news with others in the Allen West for President community! Beware of Donald Trump: He’s no conservative! Obama slaps Israel in the face — on Passover! The Taliban LOVES our rules of engagement! Letter to America -- "written by people who came from where Obama is taking America to"